Hey there! I'm Sam, and is this a great day for baseball or what? How about a game of pepper and a non-cola soft drink? 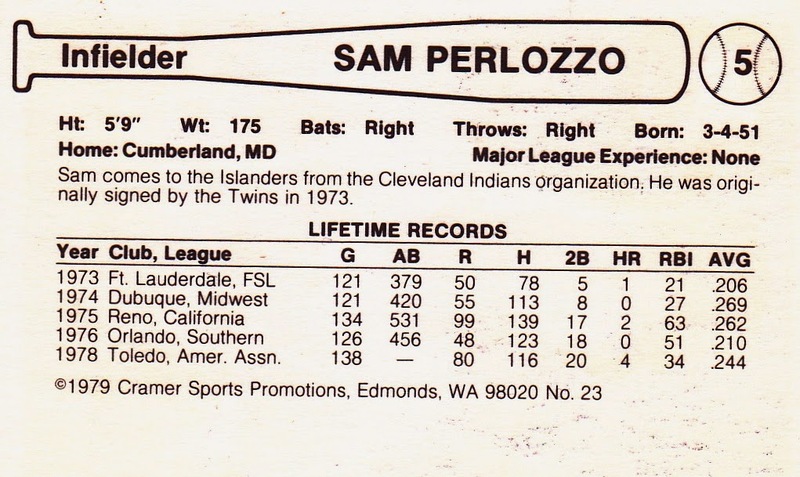 If "Sam Perlozzo" rings a bell, it's likely from his mid-2000s stint as Orioles manager, during a time of team roster and management turnover. Along with a shuffling of their front office in 2006, vets Rafael Palmeiro, Sammy Sosa, and B.J. Surhoff all left Baltimore and touted prospect Nick Markakis made his debut. This double-handful of new contracts didn't change the year-end standings, as Baltimore still placed 4th in the AL East. They wouldn't finish higher until 2012 (2nd) and finally won their first division crown in nearly 20 years in 2014. "Cramer Sports Promotions" is the same company that first received a MLB license during the 1990s as Pacific, thanks to their focus on Spanish language sets. They were later granted a "full" English language card license, but lost it, as did several others, when MLB cut back licensees to Topps only after the junk wax era imploded. 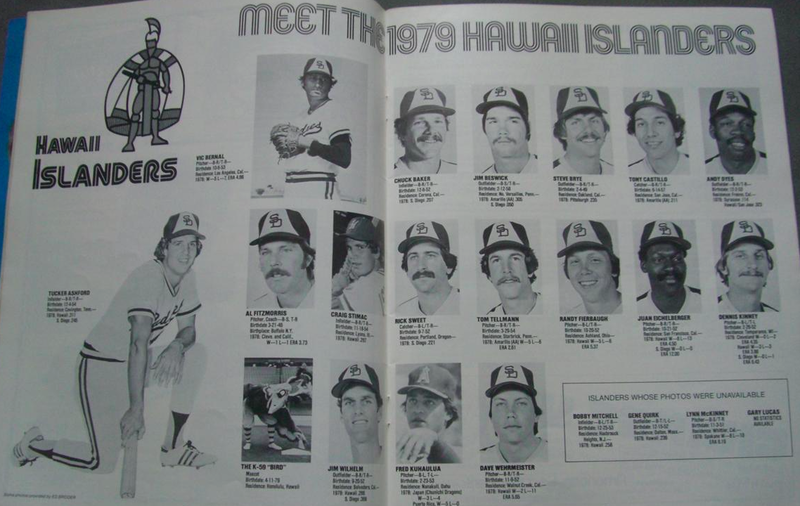 In 1979, Cramer Sports and TCMA both sought business from western minor league teams and Hawaii is just one of several franchises who purchased a set from both. I ran into a problem tracking down today's type card, at least as the "real #5." The above card is Sam's TCMA version, which shows a "5" right on the front. So why doesn't it appear that way in catalogs? I'll blame the confusion over "numbering by checklist" or "numbering by player uniform." 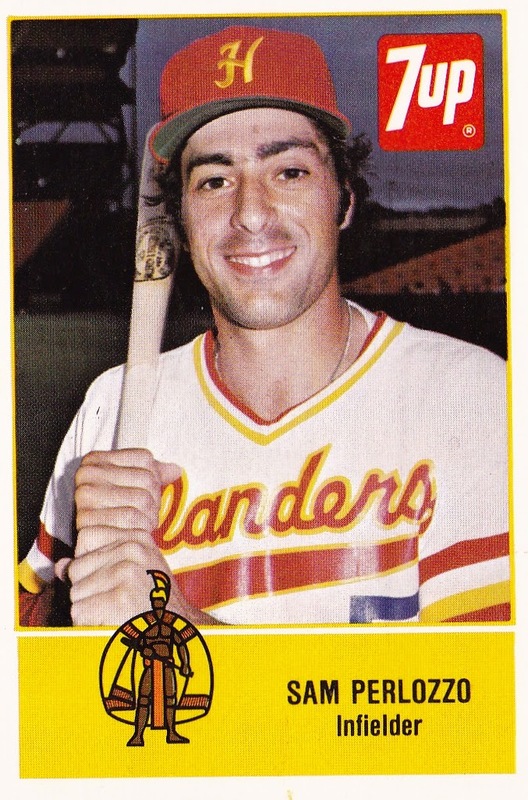 Many team sets simply used a player's uniform for their card, even if that meant skipping over unused team numbers in the checklist. Other times, they created a real checklist without gaps, regardless of the player's jersey. In 1979, TCMA blended these concepts by putting "5" (his uniform) after Sam's name, but checklisting him as #11. So the TCMA isn't a "real" #5 for my type collection, but the Cramer version at the top is. One small mystery solved. 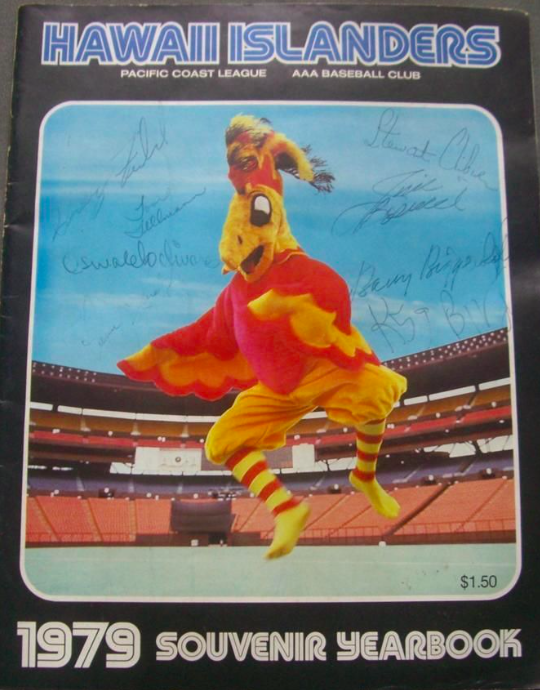 That's not the San Diego Chicken on Hawaii's 1979 souvenir yearbook, it's a bird. What kind of bird? Just "The Bird." I feel the Islanders marketing department could've tried harder here. Team photos likely came from MLB spring training, so you get to see most of the squad in San Diego uniform. As the Padres AAA club, many received a MLB call-up somewhere along the way. Cramer used the aforementioned "uniform number" scheme, so its set checklist goes to 29 but includes 23 players plus a title card. Players who reached the bigs in bold. 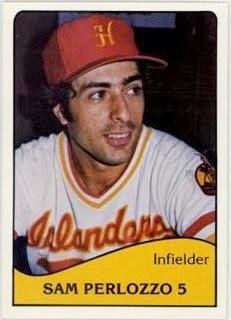 For those scoring at home, #28 Andy Dyes is TCMA's #5 for the "other" 1979 Hawaii Islanders team set. Value: Singles like Sam Perlozzo run a dollar or two, when available. It's more common in the minor league marketplace to buy complete team sets for $15-20. This particular card came from a trading friend (Sam of OBC) who purchased a lot of Islanders team sets from eBay and pulled a type card for me. Fakes / reprints: Haven't heard of any Cramer Sports reprints and it's unlikely this particular team would've been reissued, since it lacks big name MLB stars. Site news: This year, 2015, I finally registered Number5TypeCollection.com as a real domain for this blog. Pop the champagne!